Fine Gael Kildare South TD Martin Heydon has today (Thursday) called on Kildare County Council to ensure that works are carried out as soon as possible to ensure the re-opening of the Coughlanstown Road outside Ballymore Eustace which has been closed for the last few weeks. Deputy Heydon was speaking after he met concerned local residents who are all affected by the road closure. 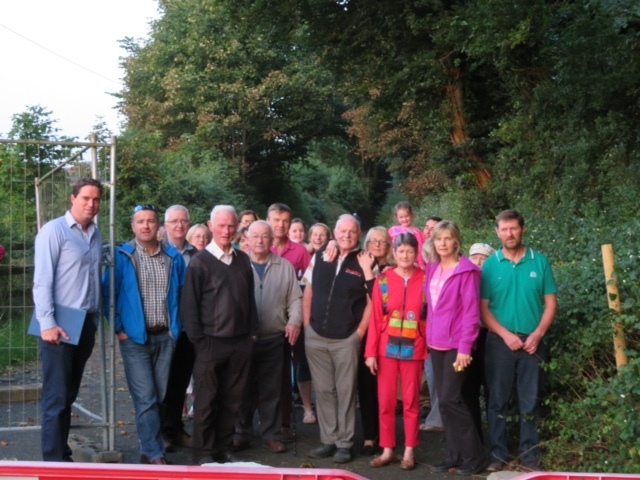 “Following a number of calls to my office, I met a large number of residents from Coughlanstown and surrounding areas last night to view the damage that has caused the recent closure of the L6048 Coughlanstown road. A burst water main earlier in the month has resulted in serious subsidence of the road foundation and adjacent river bank which forced the closure. “Residents in the area are very concerned that given the level of damage it could be some time before the road will re-open and emphasised to me the importance of the road as a local artery and link to Ballymore Eustace. The continued closure of this road will impact on local residents and businesses alike as well as putting additional pressure on adjacent roads which are now taking more traffic than they normally would. Shops and businesses in Ballymore Eustace rely on trade from the rural hinterlands who are now restricted in getting to the town. “I have today raised my concerns with local Council engineer and the Director of Services to find out what steps the Council have taken to date on options to re-open the road and to get a timeline on how long they envisage that it will remain closed. “I have asked the Council to give me assurances that they will do whatever is necessary to re-open this road given its importance to the local community. I have also asked for additional resources to be assigned to the adjoining local roads in the meantime to take account of the increased traffic volumes while the Coughlanstown Road remains closed. “I will continue to push Kildare County Council for a speedy solution to this issue and to keep the local residents informed and updated as that process continues.